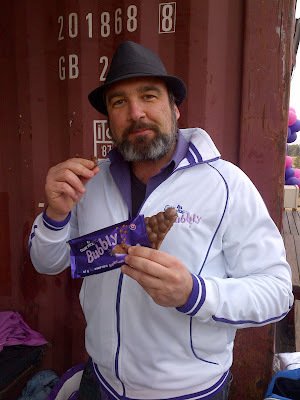 A couple of weeks ago I was flown up to Joburg by Cadbury’s to compete in the Bubbly Challenge. Most of my readers thought it was something to do with champagne, which is understandable. But it was actually the launch of the new Cadbury’s Bubbly chocolate. We weren’t sure what to expect, but it turned out to be a really fun day. We were taken to Jozi-X, which is an outdoor adventure park. We competed in various challenges like rock wall climbing (I sucked), tight rope walking (I sucked), monkey bar swinging (I rocked) and jousting (I rocked). We also ended of with some Zorb racing. It was all great fun. They’ve produced a cool video (below) of the day which is worth checking out for a few laughs. You get to see me take a tumble from several angles! Thank you Cadbury’s for a fun outing and for producing an awesome new chocolate (to which I am now addicted! ).